Open water off Alaska’s coast in early April. The winter of discontent in the Arctic has morphed into a spring of discontent. Shocking new data shows that the region has lost almost all its old sea ice. Its disappearance, driven by warming waters and rising air temperatures, means the region is losing a bulwark against even more dramatic sea ice loss. 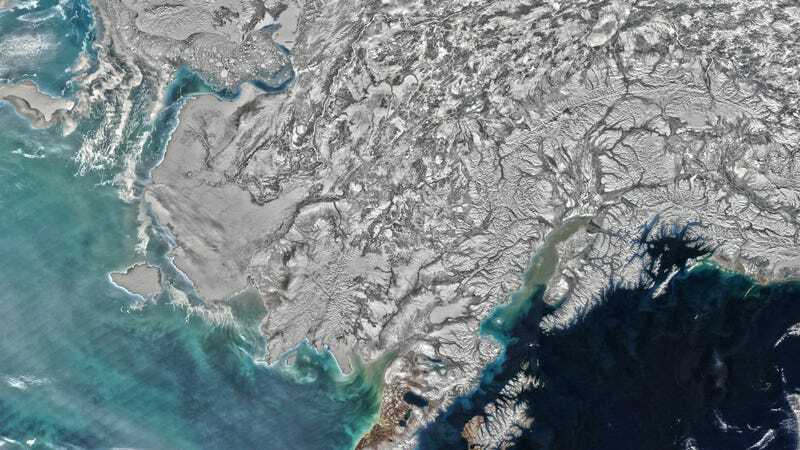 On Thursday, the National Snow and Ice Data Center (NSIDC) released its monthly sea ice analysis. It shows that April saw its second-lowest sea ice extent on record, driven by a massive meltdown in the Bering Sea (reminder: ice started melting there during Arctic winter). The graph of ice in the region looks like a cliff from which I have fallen, screaming “climate change is real” as I tumble into the abyss. The disappearance of ice has real world consequences because it normally acts a buffer for people living along the coast in Alaska. Without it, storms can stir up huge waves that cause the very ground communities sit on to be washed into the sea. It also messes with indigenous hunting, creating a huge food security issue in remote villages. “The sea ice loss has disrupted community’s timeframes, schedules, and areas where we normally hunt ice-associated marine mammals,” Austin Ahmasuk, a community advocate with the Bering Straits Native Association, told Grist. But there’s another harrowing stat in NSIDC’s report. Old Arctic ice is at its lowest level ever recorded through the first nine weeks of 2018. Ice older than one year covered 61 percent of the region in 1984 during that initial nine week period. In 2018, it covered just 34 percent. Just two percent of the Arctic’s sea ice is five years old or older, compared to 30 percent in 1984. The disappearance of old ice is a huge deal. That ice tends to be thicker and firmer and thus, less prone to cracking up. But no matter the thickness of ice, it’s hard to be resilient to the rapid warming that’s occurred in the Arctic and the wild heat waves that have sent temperatures spiraling above freezing in the dead of winter in recent years. 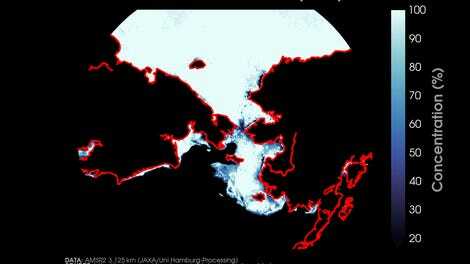 Recent research has also shown that dams of sea ice in some of the straits ringing the high Arctic—where most of the old sea ice in the region lives—have broken up. That’s allowed old ice to slide into the warmer waters of the North Atlantic. Once old ice melts or exits the Arctic, it’s nigh impossible for it to regrow in the region’s increasingly warm climate. Instead, wimpy young sea ice forms. 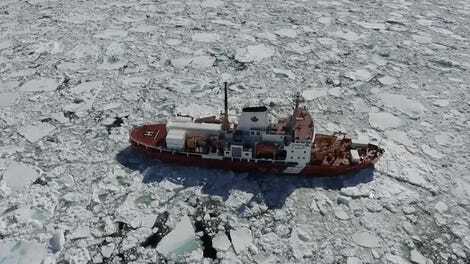 That thin, brittle ice melts faster and is more prone to breakup during the Arctic cyclones that spin up in the summer. A massive cyclone in August 2012 did just that, breaking up sea ice and likely contributing to that year seeing the lowest Arctic sea ice minimum ever recorded. After the second-lowest Arctic sea ice maximum ever recorded this winter, the region is already on thin ice, quite literally. Another large cyclone or intense heat wave could put this year on track to set a new record. Update 4:15 p.m.: This story, published Friday morning, was based on information on the age of Arctic sea ice provided in a Thursday report by the National Snow and Ice Data Center. On Friday afternoon, the NSDIC tweeted that it had found an “error” in its ice age analysis, and that as a result, it was deleting the ice age section in its report. When contacted by Earther, a spokesperson said that a new report with updated results will be available Monday. We’re obviously as keen to know what the NSDIC screwed up as they did, so we’ll provide an update as soon as it’s available. Until then, please take any conclusions about Arctic ice age with a grain of salt. The original story follows. Update Monday, May 7: The update from NSIDC is in. The amount of older ice in Arctic icepack is 34 percent, not 14 percent as they had previously reported. The amount of ice five years old or older is two percent, not one percent. So yeah, still not a pretty picture. We Really Fucked This Place Up, Didn't We?